It's a Garnstudio pattern, knit in their alpaca. (And you know what? The yarn is recycled! 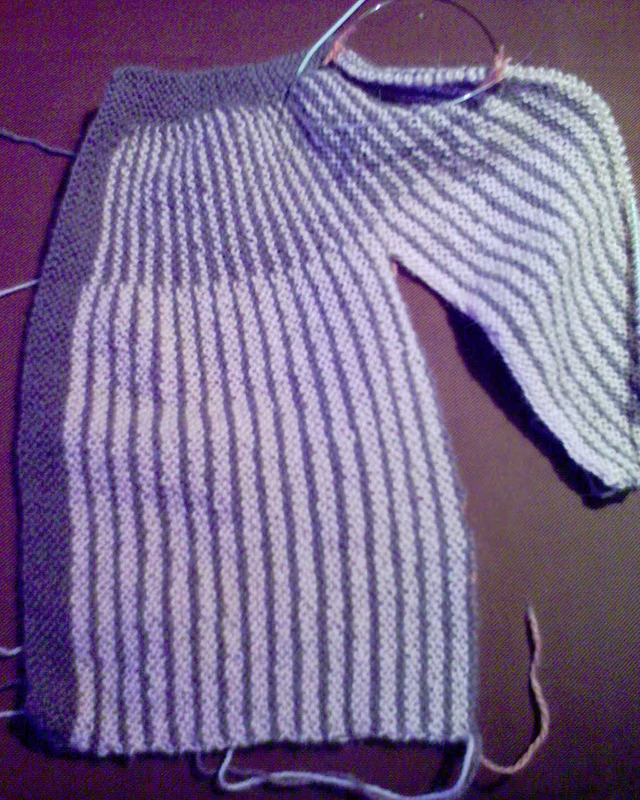 You can never guess what I frogged...) It's knit from the left side front edge to the right, sleeves and all in one piece. What you see on the right is the left side front and two thirds of the left sleeve. It's knit with short rows, I think, and I just can't figure out what colours the buttons should be. Any suggestions? I took the photo using my new mobile camera. I know it doesn't take the best pictures, but I don't know why I always have to wait until late and dusk with immortalizing my WIP's. The colours are, as always, not accurate. It's baby pink and a greyish purple/dark lilac, a match made if not in heaven then at least halfway up.